What is optical wavelength service? Why should my business consider optical wavelength for my Wide Area Network (WAN) or Metro Area Network (MAN)? What are the benefits of optical wavelength? Enterprises increasingly store and transport huge quantities of data to enable critical business decisions and to allow marketing teams to extract valuable insights from it. But this data is only useful if you can transport, process, and protect the information efficiently and quickly. To meet these critical requirement, enterprises often choose to combine all their data and application processing in just a small number of data center sites. Optical Wavelength Services (OWS) help you connect those locations and streamline the flow of information with impressively high bandwidth speeds. You can access your data reliably and securely with the advanced security solutions and private point-to-point connections that are inherent with the OWS offering. 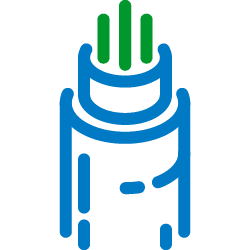 Optical wavelength service uses Dense Wavelength Division Multiplexing (DWDM) to multiplex multiple wavelengths across a single strand of fiber optic cable to help you easily transport large files, apps and data sets between various facilities and your data centers. This allows transport of up to 96 channels over a single strand of fiber which translates into higher capacity at a lower cost. OWS is commonly used for financial transactions, R&D, medical imaging, site mirroring and data-intensive apps. It is a point-to-point topology (vs switched Ethernet) and can be custom configured with multiple circuits to provide equipment, path, and route diversity/redundancy. The service is a highly reliable layer 1 transport with low-latency, low-jitter that can be scaled from 1 GigE up to 100 GigE at a VERY low cost per bit. Wavelength is typically available in bandwidths of 1 GigE, 2.5G (OC-48) or 10G (OC-192 \ WAN PHY), 10G LAN PHY. 40G (OC768), 100G OTU1 (2.666G), OTU2 (10.709G), OTU3 (43.018G) and OTU4 (112G). Network management burden relief: carrier-owned fiber and repeaters allow you to focus on your business, not network management. CarrierBid has been in business since 2006 and we use our experience and intellectual property to assist and advise you so that you can PLAN to be successful with your network design and implementation. We’ll help you with actionable goals and realistic timelines to support your mission and vision. Our services are free of charge to our clients, so there is no risk to engage CarrierBid on your next project and into the future.